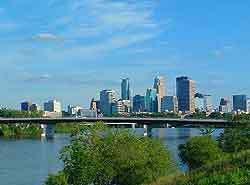 Minneapolis stands in the state of Minnesota, alongside side the western banks of the Mississippi River. The area encompasses two large cities, with St. Paul standing just a short drive from the city of Minneapolis. Often known as the 'Twin Cities', Minneapolis and St. Paul both contain many superb places to visit and stay. Minneapolis is also referred to by locals as the 'City of Lakes', after its extensive selection of parklands and vast network of lakes.